I feel bad when drawing this comic sometimes. Hope you had a happy Havocfest though! That is the most painful sound effect I’ve ever heard. 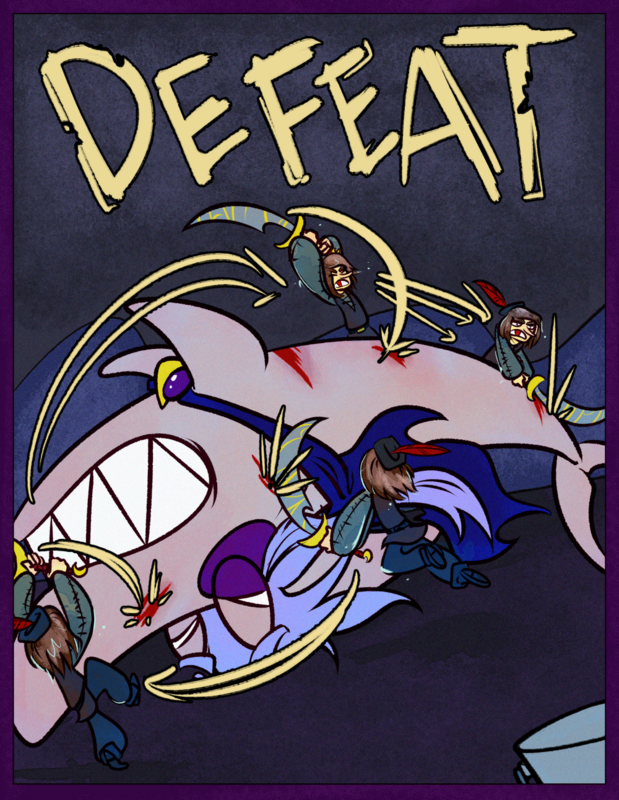 Yeah, I wasn’t sure what to put there but I went with Defeat because it sounds both positive if you’re reading this story from Blank’s perspective and distressing if you’re reading it from Skärva’s. But he doesn’t have any in shark form. I guess you could say he was de-feeted! Poor Poor Skearva… Maybe next time! I like the dripping water effect you put on Blank. Well, hopefully he has more blood in this form so this isn’t as HORRIFYING as it looks. I mean, dude, chopping up a defenseless villain? Blank isn’t showing a lot of hero cred. It’s like he’s making sushi! Not good for Skarva, but we adventurers know this is the most satisfying part of a boss battle. It is like shooting fish in a barrel. Not very sporting.